EDI is an abbreviation for Electronic Data Interchange, a technology developed in the sixties to exchange messages between information systems. The term is commonly used in relation to the shipment of pallets and containers and is most often used to represent the international standard EDIFACT. The EDI software that was developed to allow for communication between computers is used to replace paper orders, delivery notes and invoices. Instead of these paper documents electronic EDI messages are sent, which can be processed mechanically. In principle, this can be done for any type of corporate document, EDI invoices and EDI dispatch messages alike. The EDI connection simplifies sending documents in a cost-efficient manner. 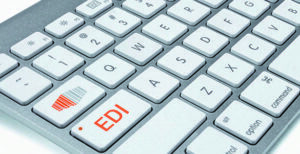 There are many advantages to using EDI. We’ve summarized a few of the largest ones below. Integrating EDI in your corporate policies makes specific actions obsolete. There’s no longer a need to put your delivery notes in an envelope, frank and post them. The recipient won’t have to wait for the message to arrive by post but will receive it almost instantly. Besides that, there’s no risk for EDI messages to arrive damaged. This is an example of how the use of EDI can create quite the cost reduction and make it possible for teams to be optimized as less manual actions are needed. On top of that EDI messages are transparent and accessible at any moment, making a better service to the end-user possible. With all these advantages it only makes sense that more and more companies choose to integrate an EDI connection in their corporate processes. EDI messages come in all kinds of different variants. Some message formats are specific to a corporate branch, whereas others are more general. Aside from standard EDI / EDIFACT messages, electronic messages in XML or JSON format are becoming more common. The upside to these formats is that they can be viewed in a browser and programmers or more familiar with them. Thus, messages in these formats can also be processed without human interaction. A lot of the larger companies use internal software packages to handle EDI, which can be quite susceptible to maintenance. Requiring a constant investment of knowledge to keep the system up-to-date. To bypass this, a SaaS solution is often chosen to handle the EDI messages. SaaS platforms are often more extensive than internal EDI systems and are up-to-date with the latest standard. SaaS solutions are also approachable from any device, as long as there’s an internet connection. Will Palletlabel become your new EDI partner? Are you looking for a partner to help you with the integration of SSCC labels and EDI? Then you’ve come to the right place! Not only is Palletlabel a working, convenient SaaS solution, it’s available starting at only 40 euros per month. You can use Palletlabel’s EDI services at any moment and at any place. Not only allowing you to speed up your business processes, but also save on the costs of sending out paper business documents.